What makes a report of a UFO sighting credible? I have always relied on the standard set in a book I read years ago called "The Mothman Prophecies," by John Keel. If that title seems familiar, you may be thinking of the hopeless movie version starring Richard Gere, and if you have seen that movie, I pity you. 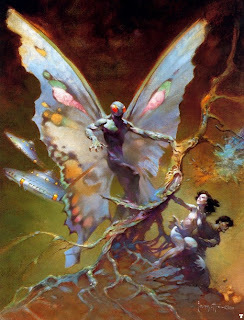 The book is actually a rousing tale, told as a first-hand account, of encounters with the strange being illustrated here by famed fantasy artist Frank Frazetta. In the book, Keel recounts a UFO encounter of high strangeness investigated by a colleague named Dr. James MacDonald. MacDonald tells of a man who not only encountered a UFO and its occupant, he had a long talk with that UFO occupant. What they discussed escapes me now, but in the middle of the conversation, the UFO occupant mentioned that it was thirsty. All the man had in the fridge at the time was a bottle of orange soda pop, so he offered it to the UFO occupant. The parched UFO occupant accepted it and drank it down. Presumably, the UFO occupant was refreshed. And presumably, it and the man then continued their conversation for some time before the UFO occupant returned to its ship and zoomed off. MacDonald does not report whether the man returned the bottle for his 5 cent deposit. To my knowledge, this is the only recorded instance of a human being offering a cold, refreshing soft drink to an alien life form. MacDonald was so struck by the man's mention of the soda pop incident that he believed the entire story. Why, MacDonald reasoned, would this man fabricate such a sensational story and then punctuate it with such a ridiculous, mundane detail? Surely the soda pop moment would cast doubt on his testimony if the story was false, and therefore MacDonald felt the entire encounter must have really happened. MacDonald coined the term "Soda Pop Factor" to describe any such realistic detail that lends credibility to an outrageous tale, simply because it doesn't belong there. MacDonald's reverse logic may be a bit strained, but on some level it appeals to me. 1) If a UFO sighting report makes any mention of orange soda pop, it must be true. 2) If the aliens do prove to be hostile, don't try to kill them with orange pop. You'll only be quenching their thirst, making the situation worse. 3) Stephen Hawking is a dummy. I know this for a fact. Recently my wife and I were watching an episode of "Stephen Hawking's Universe" in which the famous physicist was imagining what life on other planets might look like. He imagined strange snow-leopard things that could breath hydrogen, and floating gas bags that could thrive on nitrogen, and even some oxygen breathers that could live on barren, desolate worlds that just barely qualify as "earth-like." As intriguing as his fantasy creatures were, it was clear that not a single one of them could drink orange pop if it was offered to them. Maybe the wall-crawling sucker-mouth beasties, but only with a straw. What gives, Stephen? I suggest that all the time, energy and money that we are pouring into searches for extraterrestrial life are being wasted, and the searches themselves are fatally flawed and destined to fail. Because all we ever look for is whether a planet has liquid water. We never consider whether a planet has liquid orange pop. 4) WHY DIDN'T THAT GUY HANG ONTO THE BOTTLE??? Pardon, but it was UFO researcher Donald Keyhoe who invented the expression "Soda Pop Factor"
Then John Keel got it wrong, because he attributes it to McDonald, and I was going by Keel's account. Thanks for your comment. Look, sorry to throw a spanner in the works but this is a classical case of one story passing from place to place. IN FACT the term 'soda pop factor' was mentioned by Dr. J. Allen Hynek recounting an investigation he undertook and the witness, describing running from an 'object' hovering near him, said he "tripped over a Soda ca" and fell over. Hynek reasoned why would he add in that small unrelated incident if he was making something up. Hynek used this in educational sessions with new and existing researchers to use as a psychological aspect to look for. He indicated to look for the same sort of factors in other reports, to at least add to the possibility of a more credible account. I know this from first hand involvement. I was heavily involved with UFO Research, CUFOS and Hynek in the 70's. Check it out if you like. Hynek is even on tape in a recorded UFO Special saying this. Hey, I don't mind being corrected if it means learning something new. What you have to say is very interesting, but I have a few questions. Again, I was going from John Keel's account, so if the story is wrong then why did Keel get it wrong? What didn't he know? ?